This means taking steps to identify and repair dangerous conditions, and warning guests and visitors about known dangers they would not otherwise be able to detect on their own. Clearing snow and ice from walkways and other areas that people are expected to walk over would be part of this duty, and if an injury happened because an area was inadequately cleared, the owner/business operator may be liable for medical bills, lost wages, and pain and suffering. 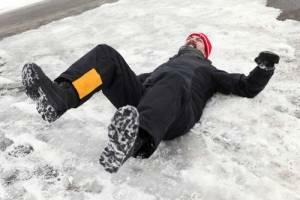 Illinois has specific rules that govern a property owner’s liability for an injury related to a fall on snow or ice. In order to encourage people to clear their sidewalks and other walkways, a law was passed that protects property owners from liability for these injuries if the accumulation was due to natural conditions. In other words, if the forces of nature, i.e., wind and precipitation, caused snow and ice to form in a particular place, failure to sufficiently clear it for the safe passage of others is not a negligent act someone could use to sue for compensation. Additional examples of conditions considered to be natural accumulation include snow and ice tamped down by human foot traffic or cars and snow tracked into buildings that later forms puddles when it melts. Instead, Illinois follows the unnatural accumulation rule, meaning unless another condition on the property caused the snow and ice to form, such as clogged storm drains or leaking water pipes, the property owner has no liability for a fall. Note that exceptions exist to the rule against liability apply if the lease requires the landlord or property management company to clear the snow and ice. These cases are complicated to assess and investigate, and working with an experienced personal injury attorney is essential to building a strong case that is capable of winning compensation. Being injured in a fall is a scary and helpless situation. Do not allow a negligent party to escape responsibility, and talk to a personal injury attorney about asserting your rights. The dedicated DuPage County personal injury attorneys at the Mevorah Law Offices, LLC understand the pain you are experiencing and will fight to get you the money you deserve. Contact the office at 630-932-9100 for a free consultation.